The Roman Empire reached its peak around 150 AD, with a population of perhaps 30 million, of which at least 1 million lived in the city itself and 8 million it Italy. But by 650 AD the population of Italy was down to an estimated 2 ½ million and Rome itself to a mere few thousand. How had this catastrophic decline happened? Plague struck in the 160s and the population never recovered, leading to economic stagnation, decline of the towns, small farmers being replaced by huge slave or serf estates, massive government financial deficits and debasement of the coinage. About 95% of government income came from farming. By the 3rd century AD all free inhabitants of the empire were “citizens”; but instead there came to be a class division into rich and poor, the “honestiores” and “humiliores”. It is obvious, and significant, what modern words derive from these terms! There were civil wars and government chaos, especially in the third century. Following the murder of the Emperor Alexander Severus in 235, Rome had 30 “recognised” emperors in the next fifty years, plus endless claimants and usurpers in the provinces. There were also new external enemies. In the east, a new Persian Empire fought endless wars with Rome over the next 400 years for control of Iraq, Syria, and Armenia. Around 240 came the first appearance of the Goths: Germanic herdsmen originally from the Baltic, who became divided into the Ostrogoths in the Ukraine and the Visigoths in Romania. They had to keep moving to find new pasture for their vast herds and flocks, and began raiding into the Balkans and across the Black Sea into what is now Turkey. Far to the east, vast tribal movements, possibly caused by climate change, led to the westwards migration of the Huns; Asiatic nomads. They reached the eastern Ukraine around 375, driving the Germanic peoples of central Europe up against the Roman Empire on its Danube and Rhine frontiers: not just the Goths, but also Franks, Vandals, Burgundians, Lombards, Alamanni and others. For the next thousand years, Europe would be terrorised by periodic irruptions of central Asian tribes; horse-archers of the steppe: Huns, Avars, Magyars, Turks and Mongols. The new dangers were shown by the erection of a new wall around Rome about 270: the Aurelian Wall. Rome might have seemed doomed, but the Empire was saved and given another century of life by Diocletian (284-305), an illiterate peasant from the Balkans who rose to be Emperor through the army, and restored order at cost of setting up a totalitarian state. He divided the empire with a colleague, Maximian, an even rougher Balkan peasant; Diocletian ruling the east and Maximian the west. Maximian however established his headquarters not at Rome, but at Milan, being more central strategically. From this point, Rome ceased to be the capital and was seldom visited by the Emperors, though retained the senate and other trappings of a vanished authority. The army doubled in size; but with falling population levels, more and more barbarian tribes were admitted into the Empire and given land in return for providing soldiers. Soon the army ceased to be Roman in any meaningful sense, with its manpower including large numbers of Germans or even Huns. Towards the end, the army was commanded by barbarian warlords; Goths, Vandals and others; who no longer even bothered to Latinise their names. Diocletian introduced an “Emperor cult”; the Emperor was now to be treated as a semi-divine being: an innovation seemingly adopted from Persian traditions. He wore fantastically elaborate costumes on ceremonial occasions, his court was regulated by detailed ritual, and those approaching had to prostrate themselves in his presence. Christians naturally would not acknowledge the Emperor’s divinity, and so Diocletian conducted last great persecution of Christians for refusing Emperor-worship; though this seems to have been more severe in the eastern part of the Empire than in the west. To safeguard trade and industry, unpopular jobs were made hereditary: thus a baker’s son must himself become a baker, and must marry a baker’s daughter. In some of the hardest jobs, such as mining or quarrying, men even branded, so they could be identified if they escaped. Running away from one’s job could even lead to execution. To safeguard tax revenue, towns were ordered to produce a fixed sum; and if this was not forthcoming, town councillors had to make up any shortfall from own pockets. With the towns in decline, this proved extremely unpopular: a little later, the Emperor Maxentius found an ingenious way of persecuting Christians,: namely, by compulsorily appointing them town councillors! 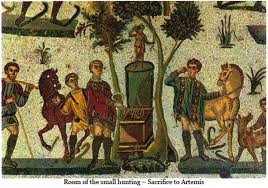 (in the centre of the island there is a villa with magnificent mosaic floors which may have been his). There then followed another round of civil wars, as Constantine rose to be sole emperor; defeating and his killing rivals Maxentius (his brother-in-law, and also the son of Maximian) and Licinius (his cousin’s husband). Constantine built a new capital on the Bosphorus; Constantinople; which soon became much the biggest city in the Empire. Constantine’s dynasty ruled a reunited Empire until the family finally became extinct in 363; its survival not being helped by rebellions and executions within the family. 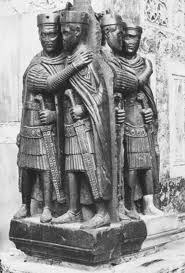 Another soldier, Valentinian, was then chosen as Emperor by the army: but he divided the Empire again, ruling in the west himself and giving the east to brother Valens. After this, there were almost always two Emperors: one in Italy and one at Constantinople. Thanks to the reforms of Diocletian and Constantine the Roman Empire gained a new lease of life, but the last few years of the fourth century brought about a dramatic collapse. This will be covered in the next blog entry.